Lazaro Medina was an Afro-Paraguayan who was best known as the founder and director of the Ballet Camba Cua, the only dance troupe of Paraguay based on the dances of former African slaves. Medina was also a political activist who assisted other Afro-Paraguayans who faced racial discrimination and the consequences of the confiscation of their lands by Paraguayan dictator Alfredo Stroessner in the 1980s. The ballet was named after Camba Cua, one of the few remaining Afro-Paraguayan settlements in the nation. Little is known about Medina’s background including his parents and date of birth. Nor is there much information about his formal training. Medina founded Ballet Camba Cua in 1991 basing it partly on the recalled stories of his father who described earlier festivals of people of African descent. The Ballet was named after the Afro-Paraguayan community of Camba Cua which was founded by a group of 250 black lancers who were given land, a team of oxen, and seeds to plant aftrer they helped defeat a ruler who was sent into exile. The goal of the Ballet was to make Afro-Paraguayan culture visible and connected to the larger world of African culture. One of Medina’s directed shows titled “The Negritude Colors” displayed Afro-Latin music along with chants, dance scenes, and songs clearly rooted in the culture of the African continent. In a nation where Afro-Paraguayans are less than 4% of the total population and where Spanish and Indian cultural forms dominate, Medina wanted to make sure the Afro-Paraguayan culture was on full display. By the late 1990s T.V. documentaries and recordings of the Ballet were commercially produced. A DVD was added later. The Ballet received assistance from the Montevideo, Uruguay based Mundo Afro. Medina wanted Ballet Camba Cua to help Afro-Paraguayans establish their visibility to the government and to the other people of the nation, some of whom continued to deny a black presence even into the 21st Century. The success of the ballet inspired Organizacion Kamba Cua which promoted activism and established contact with international Afrodiasporic and human rights groups who supported the local people in attempting to regain their lands. 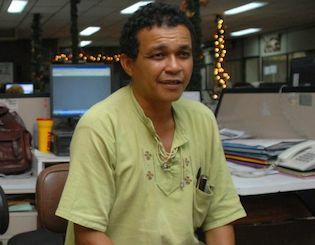 In order to challenge the myth that Paraguay had no contemporary black population, in 2007 Medina and Kamba Cua cultural development leader, Jose Carlos Medina, created a census of Afro-Paraguayans. The census focused on the three communities of Camba Cua, Kamba Kokue, and Emboscada which were found to have a total population of more than 8,000 people. Medina frequently visited these and other communities with Afro-Paraguayans to live and listen to people in an attempt to better help them fight against discrimination and the loss of their land. Medina also gave lectures outside Paraguay in a number of nations including Ecuador, Bolivia, Chile, and the United States. In 2001 he was honored for his participation at the World Conference on Racism, Racial Discrimination, and Related Intolerance in Durban, South Africa. Medina directed the Ballet Camba Cua for 22 years until his death on March 4, 2013. Since his passing the 80 members of the ballet group have adopted the motto “Lazarus Lives” to honor his influence and legacy not only in the dance world but also for his work within the community. Monica Bareiro, "Kamba Cua, Tapping of Pride and Culture," ABC Color, http://www.abc.com.py/edicion-impresa/suplementos/abc-revista/kamba-cua-tamborileo-de-orgullo-y-cultura-1200345.html; John M. Lipski, “Afro-Paraguayan Spanish: The Negation of Non-Existence," Journal of Pan African Studies 2.7, 2008; Kwekudee, "The Irresistible and Expert Drumming and Dancing African Descendants in South America, Trip Down Memory Lane, http://kwekudee-tripdownmemorylane.blogspot.com/2014/06/afro-paraguayans-afro-poaraguayos.html. South America, Trip Down Memory Lane, http://kwekudee-tripdownmemorylane.blogspot.com/2014/06/afro-paraguayans-afro-poaraguayos.html.